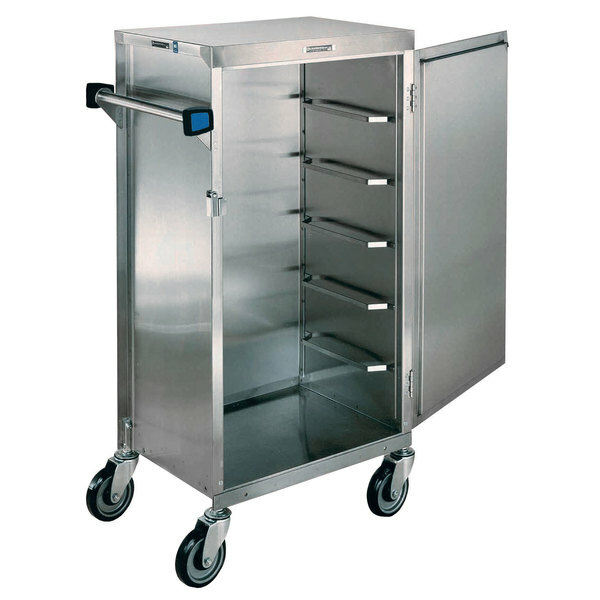 Deliver trays in a smart and convenient way with this Lakeside 854 stainless steel enclosed tray cart! It holds up to (6) 14" x 18", 15" x 20", or 16" x 22" trays, with an ample 6" of space between ledges. The front door opens 270 degrees for unobstructed access to the cabinet, while a long-life door latch will hold up to repeated opening and closing. A wide handle on the side of the cart makes it easy to push and transport the cart throughout your venue. The 5" all swivel, stainless steel, no-mark casters are heavy duty for long-lasting use and help keep floors free of scuff marks. The entire unit features stainless steel construction for superior durability. Rust and corrosion-resistant, it is also easy to clean and sanitize. Plus, you can count on sanitary storage since this cart is enclosed to protect your food and trays from dust, dirt, and other contaminants. Whether you are storing or transporting trays from the kitchen to a serving area, the enclosed nature of this rack will keep your food safe.